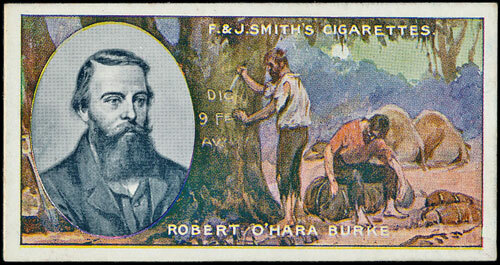 The cigarette card section of the sale contained a large number of collections and accumulations and most of these achieved figures well in excess of their estimates. 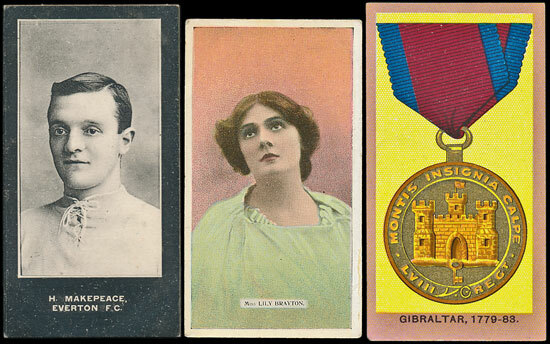 The first lot containing multiple sets by Ogden, Phillips and Players estimated at £450 realised over £700. A collection of complete and part silk sets by Anstie, Muratti, Phillips and others estimated at £350 realised nearly £550, a lot featuring better part sets from Gallaher, Illingworth, Smith etc estimated £300 fetched over £470 and a lot containing complete and part sets by Gallaher, Player, S.C.W.S. and others estimated at £280 realised £620. Collections by individual manufacturers achieved strong results, with a Mitchell range estimated £300 realising over £420 and a collection of Ogden Guinea Gold and Tabs estimated at £300 making over £550. An interesting section of individual British sets proved popular and many exceeded their estimates. Some of the most notable results included a Phillips 1900 Actresses C Series (Volunteer) set, 5 with faults, estimated at £300 realising nearly £500. 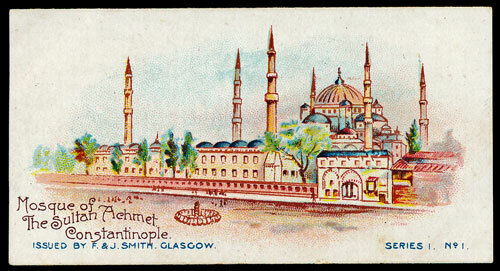 A Smith A Tour Around The World (Postcard Back) set (less 6) estimated £400 achieved £650. A Smith Famous Explorers set estimated at £200 made over £400, and a Taddy Prominent Footballers (No Footnote) part set of 30 cards estimated £150 made £270, despite 2 having faults. A Taddy Orders of Chivalry Second Series set estimated at £180 made nearly £320. The sale contained a small selection of American cards, the main highlight being an American Tobacco Co. collection of silk part sets, with an estimate of £300, which realised over £550. There was also an attractive range of American Tobacco advertising cards with an estimate of £200 which made £270. A relatively small trade card section achieved strong results across the board, including a lot of Football cards with sets from A & BC, Topical Times and Typhoo amongst others, with an estimate of £180, which made over £550. Individual sets also went well with a McEwan Old Glasgow set, estimated at £60, realising £88. Our next auction is on 20th January 2016. We will be offering a large selection of rare and interesting sets. The sale will be strong in Football cards with sets from Jones Bros., Smith, A & BC, Barratt, Typhoo and many more. The British section will include a good selection of desirable sets in good condition, with highlights being an Ardath Rembrandt Series (Splendo) set, an L & B Motors set, a Phillips War Photo’s set, a Smith Cricketers 1-50 set, a good range of Taddy sets including British Medals & Decorations, Territorial Regiments, V.C. Heroes Boer War 81-100, amongst others, a Woods Modern Motor Cars set and many others. There will also be a large trade card section with several collections on offer as well as some individual sets with A & BC The Rolling Stones, Fry Days of Nelson and Hunt Cropp Characters From Dickens amongst the highlights.